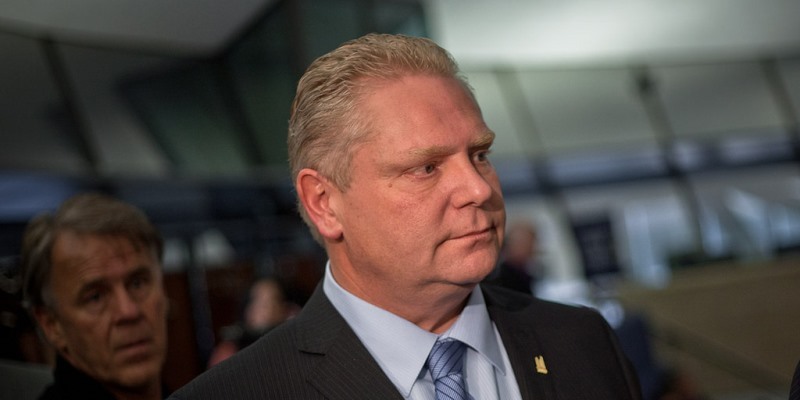 Next week, the Ford government will table its first budget and Ontarians will get the clearest signals to-date of this government’s fiscal plans. According to recently-revised fiscal numbers, Ontario has been running deficits since 2008-09—a string of 11 deficits in total—with the 2018-19 deficit estimated at $13.5 billion. Since 2008-09, Ontario has accumulated nearly $106 billion in deficits. The accumulation of both deficits and borrowing for new capital spending has increased the net debt by almost $177 billion, from $169.6 billion to $346.1 billion. And the province’s debt-to-GDP ratio (a measure economists use to measure the sustainability of a jurisdiction's debt burden) has increased from 28 per cent to 40 per cent. Clearly, Ontario has been on a fiscally unsustainable path for years but historically low interest rates have encouraged its appetite for borrowing. The chart below plots Ontario government revenues and expenditures since the 1990-91 fiscal year. Over this 29-year period, both spending and revenues have grown—almost in tandem—at average annual rates of just over four per cent. However, there have been periods where expenditures greatly exceeded revenues because of recession periods or policy-driven expansions of spending. In fact, over this 29-year period, Ontario has run deficits 75 per cent of the time. Even though revenues and expenditures over the long run have grown at approximately the same rates, Ontario has produced a structural gap between its revenues and spending with an average expenditure-to-GDP ratio of 18 per cent compared to a revenue-to-GDP ratio of 17 per cent. That persistent gap is readily apparent in the chart, where linear trend lines are fitted to spending and revenues and reveal totals that move parallel to one another, yet never meeting. The value of that average gap in 2018-19 is approximately $9 billion, which means the estimated 2018-19 deficit of $13.5 billion is well above the “average” deficit. Just bringing it down to the “average” would require an spending reduction of nearly $5 billion—a three per cent cut. So the Ford government has work to do. All other things given, assuming revenue grows at its long run historical annual average of four per cent per year and total nominal spending is frozen for two years at its 2018-19 level, Ontario could balance its budget by 2020-21. However, all other things are never given and given the slowing economy one can expect revenue growth to slow. If a recession hits, one could even see revenues fall, and like in the past, expenditures rising to deal with a slowing economy. 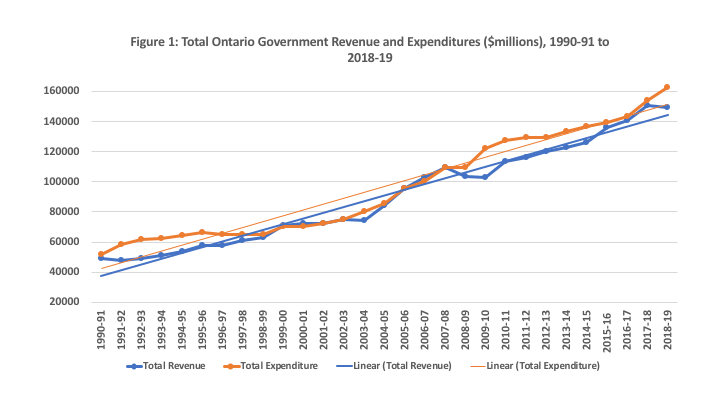 Of course, this would continue the cycle that has seen a long-term gap open between revenue and spending in Ontario, adding to the debt and further threatening fiscal sustainability. Ontario at minimum must freeze nominal spending to have any hope of closing its persistent fiscal gap. Closing the gap and making its public finances sustainable is the best way to ensure the sound delivery of important public services such as health and education. And balancing the budget and stopping the growth of net public debt will give the province fiscal room to maneuver through future fiscal and economic challenges that include the fiscal impact of an aging population. Need we say more?